We do have to make ourselves holy for the Creator of all things who let His Words to be written down in the Scriptures took care that those writings became Holy, sanctified not to be changed nor to be destroyed by ordinary man. We couldn’t be more sure of what the men of God saw, heard and wrote down. The prophetic men of God brought onto the paper God’s glory, God’s voice. The prophetic Word was confirmed to us. We’ll do well to keep focusing on it. It’s the one light we have in a dark time as we wait for daybreak and the rising of the Morning Star in our hearts. The main thing to keep in mind here is that no prophecy of Scripture is a matter of private opinion. And why? Because it’s not something concocted in the human heart. Prophecy resulted when the Holy Spirit prompted men and women to speak God’s Word. The Book of books, the Bestseller of all times, distinguishes itself from all other books, or “bibles”, as it ranks as separate and different from all others – and ranks as much more important too, as the ways of God are far more important than any other subject matter. In it it is the Ruach haKodesh, the Holy Spirit who speaks. And this Voice was a lamp to the feet of many showing the way to go. Though there may come many who like to twist the Words of God, but when people seriously would take up the Word of God as written in the Holy Scriptures they shall be able to find the truth, if they are willing to disregard the teachings of men and let the Words of God speak for themselves. It was the Holy Spirit who moved the prophets to speak from God and through the ages God took care that His Word was not destroyed but got into the language of many people. Peter goes on to say, that it didn’t come about by “the will (Greek: choice) of man” but by God’s actions. These actions are described as the holy spirit influencing “holy men” and causing them to write down God’s words. These “holy men” were obviously godly men, or God fearing men. Men who believed in what God says, that God used them as instruments, to bring about His purpose, in causing the Bible to be written. We also may accept that God did find it too important to what would happen to His Word. 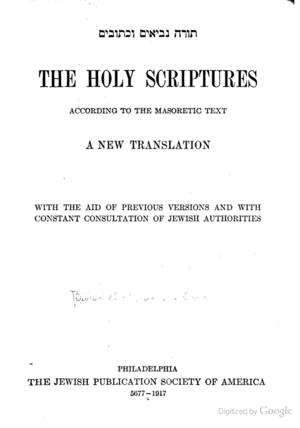 Therefore we may trust that those people who took time to spend many hours of their lifetime to write down the Words of God and to translate the Holy Scriptures in the tongue of their own people or in another language, when they were sincere, would be guided by God to bring His Words in an understandable language. The way God worked was to influence, by His power, a number of godly people, to write down words that God chose, that would form ‘The Holy Bible’, and that this book would be available to anyone who wishes to enquire after the things of God. God is the author of The Holy Bible and we understand from it that He is the Creator of the earth and the skies (Acts 17:24), He is from everlasting to everlasting (Psalm 90:2), He created men and women so that He might have a relationship with them (Psalm 8:4-6) and He tells us of future events in the earth which will bring about the completeness of His purpose (Habakkuk 2:14). Throughout history the earth had to fill up with awareness of God’s glory and from all sides of the world people were to come to their senses, running back to Jehovah God, who will be king over all the earth, one God and only one. What a Day that will be! The Bible is not some mere book; “it is in truth, the word of God” (I Thessalonians 2:13). “All scripture is given by inspiration of God” (II Timothy 3:16). In other words, the Scriptures are God breathed. God’s Word is settled in heaven for ever (Psalm 119:89); therefore, it doesn’t change. “If an earthly king, our emperor, wrote you a letter,would you not read it with joy? Certainly, with great rejoicing and careful attention. You have been sent a letter, not by an earthly emperor, but by the King of Heaven. And yet you almost despise such a gift, so priceless a treasure”. “The Scriptures constitute a coherent whole. They are at once divinely inspired and humanly expressed. They bear authoritative witness to God’s revelation of Himself – in creation, in the Incarnation of the Word, and the whole history of salvation. And as such they express the word of God in human language. …We know, receive, and interpret Scripture through the Church and in the Church. Our approach to the Bible is one of obedience”. If God were to inspire me to write a book, the words in my book would still be my words. They would not be the word of God. The Gifts of the Holy Spirit have been given to build the Church and make it whole. We neglect them to our own loss. The Holy Spirit has been given, complete with nine beautiful Gifts, to help us to minister the love, life and power of Jesus through the supernatural. This entry was posted in Bible or Holy Scriptures, Church and Fellowship, Faith, God (English articles), History and tagged Believer, Bible Translation, Book of books, Creator God, End-times, Fear God, Focus, God's actions, God's men, God's Power, God's Purpose, God's Word, God’s Glory, God’s Voice, God’s Ways, Holy, Holy Men, Holy Scriptures, Holy Spirit, Language, Last Days, Man's Will, Prophecy, Prophet, Ruach haKodesh, Scoffer, Teachings of men, The Way, Truth, Voice of God. Bookmark the permalink.